This entry was posted in Racing on February 16, 2011 by Steve Tilford. Yesterday I woke up sick. Guess I touched too many people in NYC or on the way home. Flying in the winter sometimes isn’t the best idea. Anyway, I don’t get well too quickly usually. I don’t have a spleen. I fell out of a tree when I was 6 and ruptured it. The spleen filters your blood and keeps your lungs from being infected. I have to get pneumonia shots because of it. Anyway, I’m not a Sven Nys that is sick and Friday and wins a World Cup on Sunday. Sometimes I stay sick a long while. But, I don’t stop riding when I’m sick. I just ride easier and shorter. So, I guess I have a couple days to figure out the weekend. I’m not big on traveling ill, but sometimes racing sick makes you better quick. Don’t ask me why that is. I just know by experience. I hate routines. It seems like as you age, you do get set into routines easier than when you were young. I’m not sure why that is. But, I try to avoid routine with a passion. Bromont is on a routine. He has to go running when I get back from riding. And he has to go for a walk between 10-12 at night. He usually starts bugging me by 10:30pm if I haven’t acknowledged that we’re going soon. So, I’m trying to avoid routine, but my dog gets me on a routine I love. Strange. Last night, our cat Lilly went on the whole dog walk through the neighborhood. When I got about a 1/2 mile away from home, I finally picked him up and carried him. He just wanted to watch what Bromont was doing. They’re buddies. Did you have a chance to watch the Westminister Dog show on TV the last two nights. 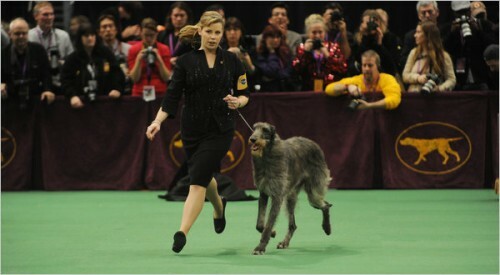 A Scottish Deerhound won the Best of Show. The dogs I saw in front of my hotel on Sunday must of been there for the dogshow. I kind of wished I would have stayed another day to watch. Would have been fun. Okay. I’ve been trying to drink a bunch of fluids. I don’t really think that helps me get well any quicker. Seems like I just have to pee a lot more often. I’ve been making fresh orange and grapefruit juice though. Seems a little like a waste, since I can’t really appreciate the taste as I should. It good for your mind either way. I’m going to do all the things that you’re supposed to do. I should probably just start taking antibiotics. Hickory, a Scottish Deerhound from Virginia. 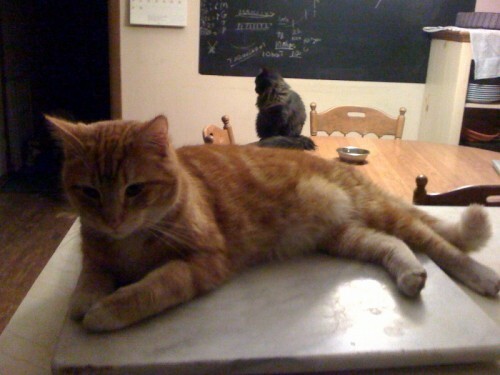 Lilly, a orange and white Tabby from Kansas. Don’t take antibiotics for viral infections (common cold). They actually build up your tolerance to the antibiotic and reduces it’s effectiveness when you really need it. Get rest and drink fluids, which is exactly what you’re doing now. one shot of vodka with a teaspoon of ground pepper right before bed – wake up a new person – old Polish recipe. Hope you start feeling better. We’re looking forward to seeing you race down here this weekend. I like Ted’s Polish cure. In honor of the Scottish Deerhound, you could always try the scottish version of the Polish remedy: a generous shot of scotch, boiling water, and honey—a teaspoon of red pepper if you’re stuffy. All good the next day.